Ontake 2240 (おんたけ2240) is one of the Ski Resort located in Otaki, Nagano Prefecture. It is located south side of Mt. Ontake. The altitude of the Ontake 2240 is 2240m from the sea level. The great features of this place is the high rate of sunny days. 2 out of 3 days are sunny. Another feature is the beautiful powder snow. It has a great view of Chuo Alps from the top of the hill. There are many different kinds of course and longest course is about 7km long. 4500 yen for adult, 2000 yen for under Junior High, 3500 yen for senior. Season: December to Golden Week in May. From the route 19 to route 20 to Otakei Village center. To north. 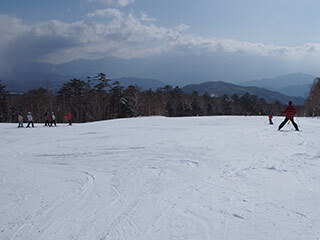 Ontake 2240 is one of the great ski resorts located in Otaki, Nagano prefecture. There are 8 different coureses including kids' course. It is the hill located over the could and has a great view of Chuo Alps. 70% of the seasons' days are sunny. Mikasa Wing: Middle. 900m long.